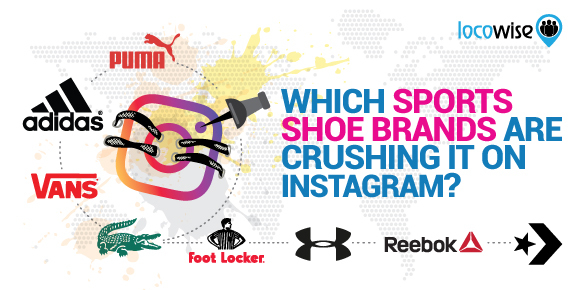 Which Sports Shoe Brands Are Crushing It On Instagram? When discussing different Instagram social media marketing topics, we often include Adidas as an example. For the most part, their campaign is creative, professional and manages to represent the brand in a coherent manner. Furthermore, it is consistent in its review and adaptation of content and manages to note steady engagement rates and growth. In comparison, Nike has a bigger following (74.1 million at the time of writing) and often receive high engagement on their posts. 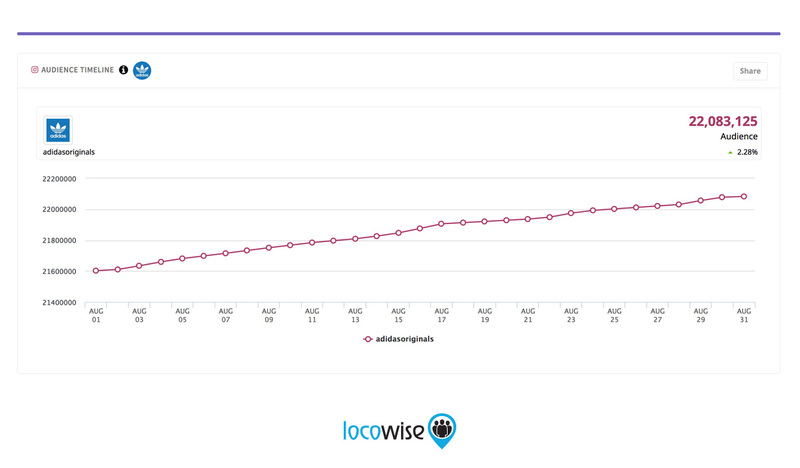 However, Nike is not a great example of having a consistently successful Instagram marketing campaign. The brand posts extremely rarely, often once or twice per month, and often relies on their established following in the industry and active celebrity endorsements and celebrity marketing content. In addition, most of their content is not Instagram-specific and is often backed up by content conversion and recycling from other media advertisements and marketing campaigns. See here how you can recycle your own social media and other marketing content. With that in mind, and with Nike out of the picture, we decided to see how Adidas and the brand’s strategy on Instagram compares to some of their top sports brand rivals using our Market Audit. With Social Audits you get presentation ready social media audits in minutes. 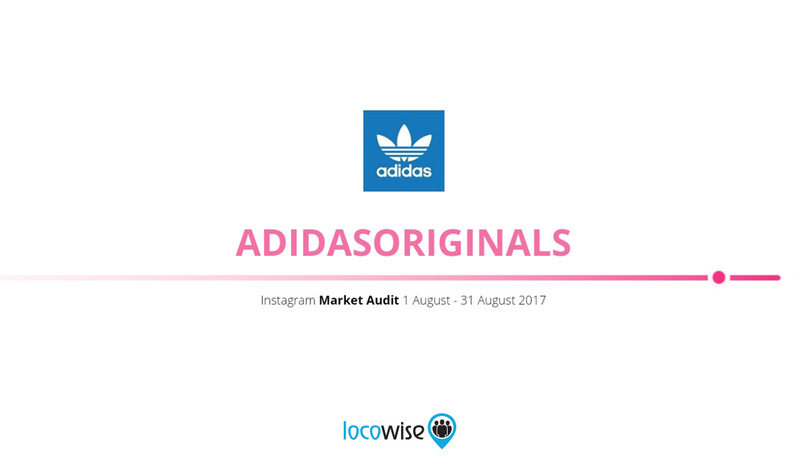 While Adidas has a main official profile, we decided to go with their more popular AdidasOriginal sub-brand profile for the purpose of this report, due to its arguably better and more regular social media marketing campaign. As their Instagram competitor brands, we decided on Vans, Puma, Reebok, Foot Locker, Under Armour, Lacoste and Converse. 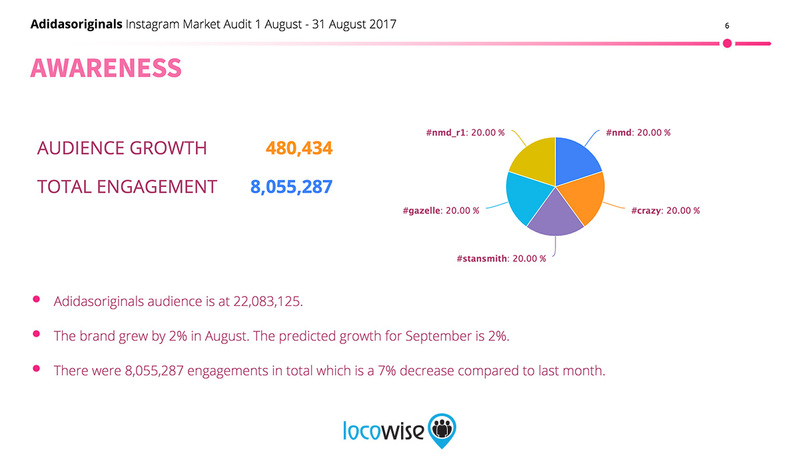 To do a timely and current analysis of their strategies we compared their performance for the month of August. And what we found may surprise you. Because it definitely surprised us. It turns out Adidas might not be the sports brand Instagram powerhouse we thought it was. Here’s a more detailed overview of our marketing report. If you want to check the full Adidas vs. Competitors Market Audit, click here. To start off, let’s take a look at the overall performance of Adidas in the month of August. 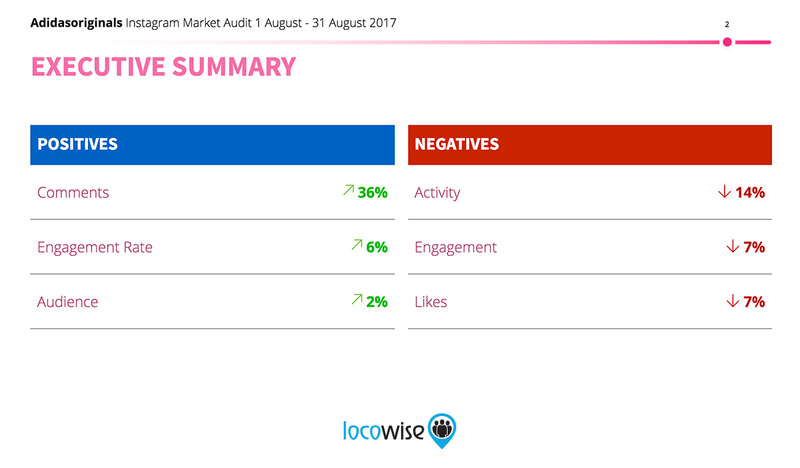 The brand noted 14% less activity compared to the month of July, which in turn decreased the total numbers for engagement and likes by 7% percent. 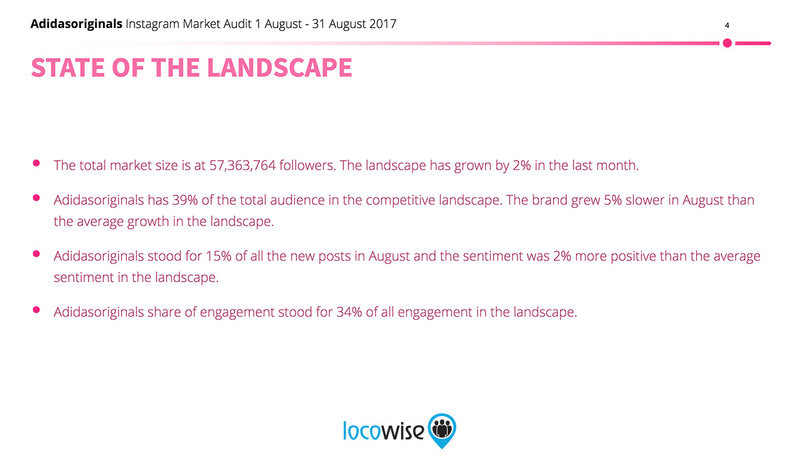 However, the company managed to note a huge 35% increase in the total number of comments and also pushed the engagement rate up with 6%. The audience of Adidas also grew by 2%. By far, all the numbers show a clear picture. The Instagram marketing campaign of the sports brand does work and it works well. They’ve managed to achieve a slow but steady growth. But they are not the top dogs in the industry. In fact, comparing the overall score of all eight brands, Adidas scores a 77 out of the total 100. Both Vans and Puma beat the score of Adidas with a few points, scoring 80 and 79 respectively. Reebok tied for the 3rd spot, while Foot Locker, Under Armour, Lacoste and Converse were slightly behind, with the latter scoring the lowest out of the bunch, 65 out of 100. During the month of August, Adidas managed to note an increase in audience growth of 3%. Compared to the number of the total landscape, the growth is 1% higher than the average number. In fact, when comparing their rates with Puma and Vans directly, you might be surprised that both brands were on top in overall score. In fact, both Puma and Vans noted a huge decrease in their audience growth compared to the previous period with -22% and -16% respectively. But the reason behind the huge scores of both sports brands can be seen in the most important statistic out of all. Adidas did manage to note an increase in their Engagement Rates (6% on average), but their score of 0.19% is way down compared to the 0.90% ER scored by both Vans and Puma. The other five brands are all around the map between Puma, Vans and Adidas, with Foot Locker lagging behind with the lowest ER of 0.14%, while the 0.89% pushes Converse right behind Vans and Puma. Reebok, Lacoste and UnderArmour are in the middle with ER scores of 0.60%, 0.46%, and 0.29% respectively. Of course, this brings into question why Converse has the lowest overall score for the industry on Instagram, but other metrics including audience growth, overall engagement and activity, the nature of the audience interaction and the sentiment all come into play when making an in-depth analysis. 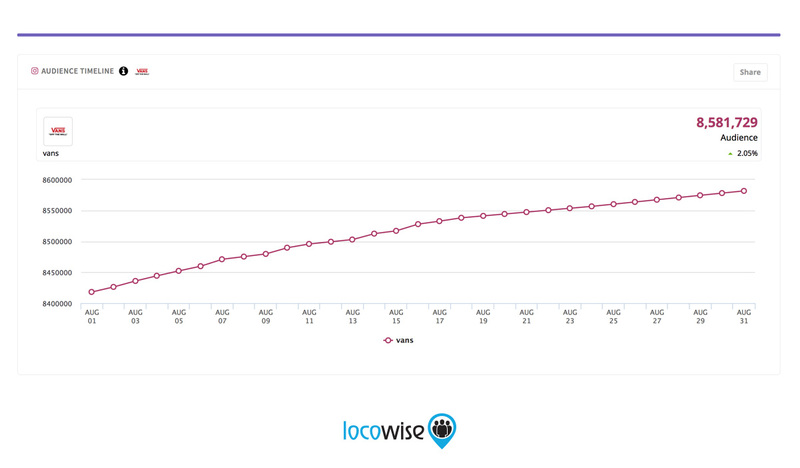 If you want to receive all the information for your competitors and have access to market analysis tools and more, make sure to subscribe for the 7-day full trial of Locowise. 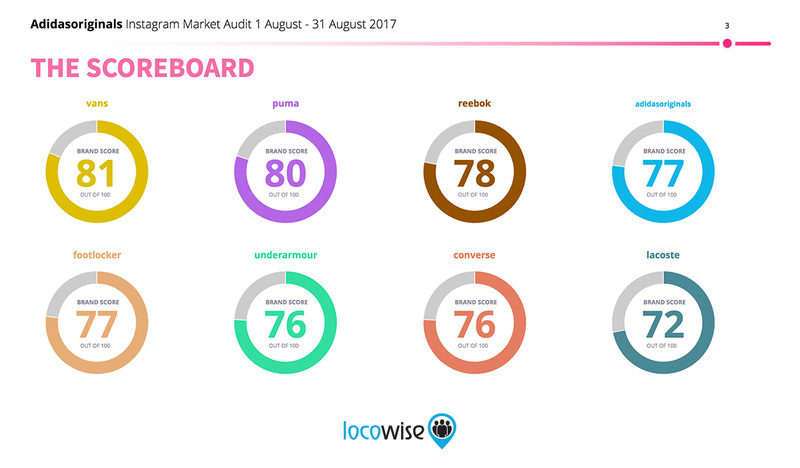 With Adidas being the main target of our Market Audit, we take a further dive into the numbers of the brand during the month of August. Adidas posted 76 times with images being 54% out of all posts. 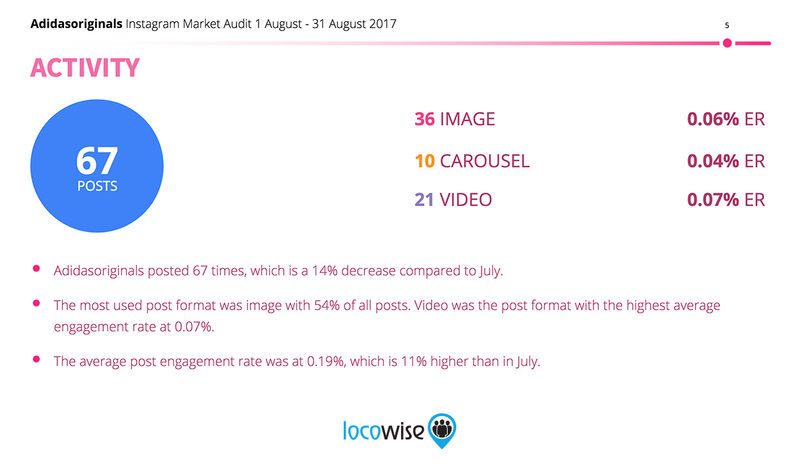 In detail, the 36 images received a 0.06% ER, the 10 carousels received 0.04% ER and the 21 videos being the most engaging format with an ER of 0.07%. The audience of Adidas grew, with some of the most popular hashtags within their audience being #nmd_r1, #nmd, #gazelle, #stansmith, #crazy. The more interesting part of the report is the difference in performance of the keywords used by Adidas in their posts. “Classic,” “adidas Originals,” “footwear,” and “women” were the highest performing keywords featured in posts from the brand with scores of 97, 81, 81 and 72 respectively. 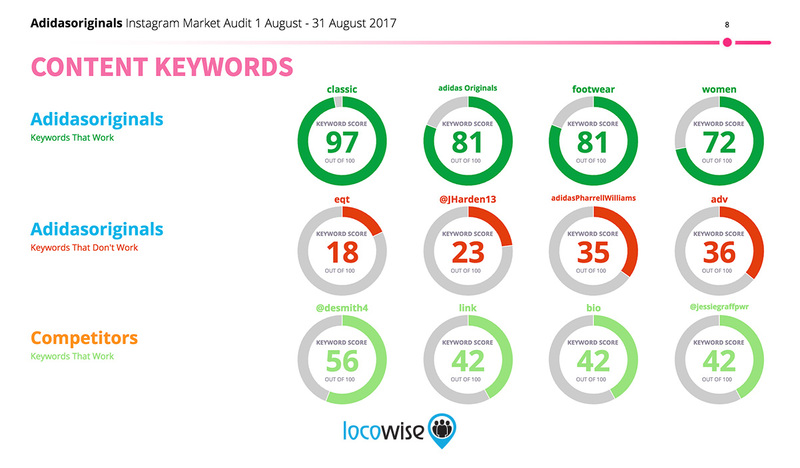 However, their lowest performing keywords managed to decrease their keyword performance score average drastically. In detail, “eqt,” “@JHarden13,” “adidasPharrelWilliams,” and “adv” received a score of 18, 23, 35 and 36 respectively. What we found interesting is that the general terms that the brand used performed far better than their celebrity endorsed marketing posts. For their competitors, the most popular keywords were “@desmith4,” “link,” “bio,” and “@jessiegraffpwr” with scores of 56, 42, 42 and 42 respectively. This shows that general posts (with tags such as “link in the bio”) performed quite well for the competitors of Adidas. What’s more, this shows that the rivals of the brand do have better celebrity marketing posts and endorsements according to the keyword score. In the landscape, the post with the highest engagement was a stylish image serving as the presentation of footwear. In specific, the post highlighted the @HenderScheme, founded by Ryo Kash. 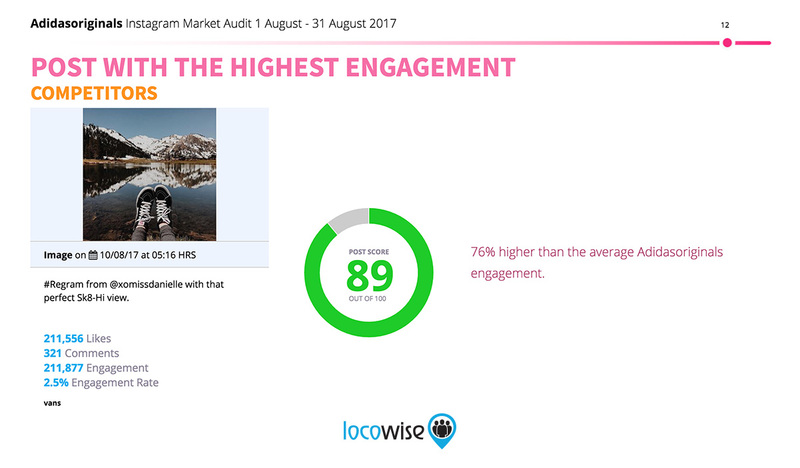 The image post received 560% higher than the average engagement in the landscape for a total of above 279,000. The overall score of the post was noted at 72 out of 100. 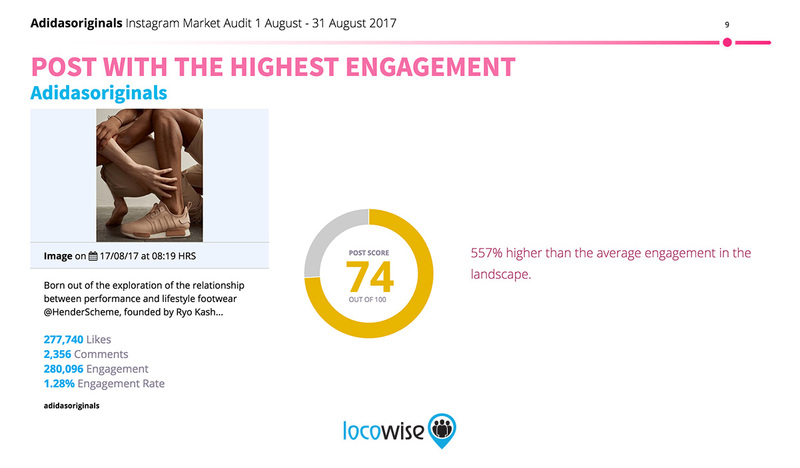 The post with the highest engagement from the competitors of Adidas had an overall score of 87 out of 100, but its engagement was lower with around 77,000-78,000. It was a regram (i.e. a repost of Instagram content from an audience member) from Vans. Surprisingly, the post with the greatest number of comments comes from Foot Locker. The brand managed to receive 4,139 comments on their NBA rookie season post. The number of comments is as much as 834% more than the average of Adidas, which is not as surprising, when comparing a top post with an average, but is still a notable achievement for the Foot Locker and their Instagram social media marketing team. In Conclusion – Is Adidas(Originals) an Instagram Powerhouse? – Yes and No! Locowise Market Audit on the performance of Adidas(originals) is clear and concise. They hold one of the best Instagram profiles for a sports brand in the landscape. However, despite having the most engaging post of the bunch, their overall performance is not as great as most other brands. What this means is that, yes, Adidas is an Instagram powerhouse. But so are Vans, Puma and a couple of others. Overall, sports brand are receiving more attention than some other industries. This is often true due to the established brand recognition of different sportswear companies. What’s more, these companies have the privilege of naturally targeting visually appealing sports content on their profile, celebrity endorsements and more. What can the Adidas marketing team learn from this report? Don’t get too high off of your own success and make sure to play your cards better. That means better celebrity endorsements, and working on increasing your ER. We hope this report has inspired not only Adidas and sports brand but all of you. We hope that this report has given you further insight into what goes into making an Instagram marketing campaign successful. For the full Market Audit, go here. 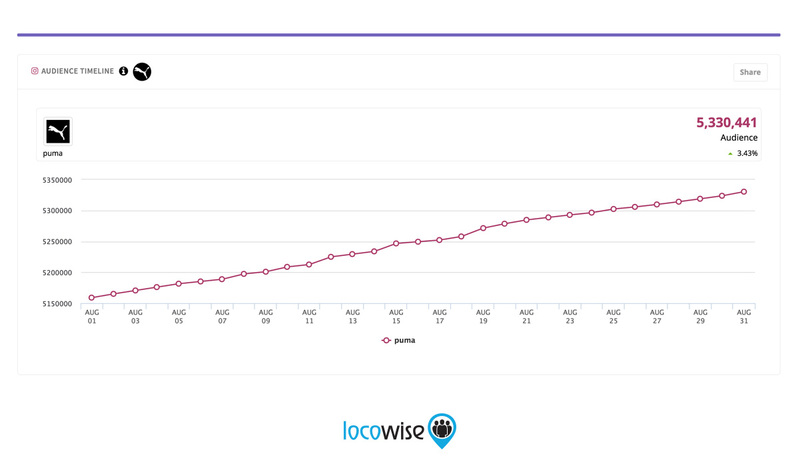 And if you want to make your own report and check how you compare to your Instagram competitors, make sure to subscribe for a 7-day free trial of Locowise.